Kids love fresh cranberry sauce! 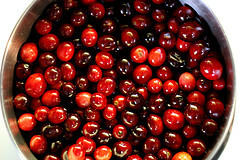 This morning, I am ramping up the basic, fresh cranberry sauce I typically make! Since organic pomegranates are on sale and in season, and I am a chia seed fanatic, these two ingredients are going to make the cranberry sauce extra special this year. Pomegranate will add an additional flavor and crunch; chia seeds will help the sauce set up, like chia seed pudding. As a child, I did not like cranberry sauce. It looked weird in its jellied can shape, and I just didn’t like the flavor. In contrast, my children love cranberry sauce! Freshly made is much preferred to organic canned, especially considering the BPA risk in tin cans. Here is a basic, simple recipe for cranberry sauce. Remember to make this ahead of time, as it needs to chill for a few hours to thicken. It is super simple! Return to boil until cranberries pop (about five minutes). « LED Lighting Functional, Modern and Versatile too! I had a bummer of a surprise this afternoon. I bought a pomegranate at the farmer’s market yesterday to put in a salad for Thanksgiving dinner (along with greens, persimmon, orange), but when I cut it open today, all the arils were brown and rotten. I didn’t know that was even a possibility. So we had the salad without them. I wonder if there’s a good way to tell if a pomegranate is rotten before you buy it. Bummer. I think if it is not firm and the color not bright on the outside you can tell. They look a little withered when they are going bad.